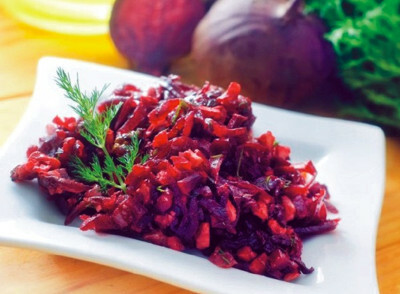 To cook Vladimir Salad you need to peel carrots and beets, wash, and slice in strips. Place each in different saucepans, sprinkle with sugar, add enough water to cover and stew over low flame for 10 minutes. When beets are done, add vinegar. In the meantime, take the boiled potatoes and slice; peel cucumber and slice lengthwise. Take green peas and all prepared vegetables and place in salad-bowl without mixing. Pour mayonnaise over top and sprinkle with parsley, dill and chopped green onions.